Manasi Gopala prepares for her sculling class Aug. 30 at Lake Wheeler in Raleigh, North Carolina. 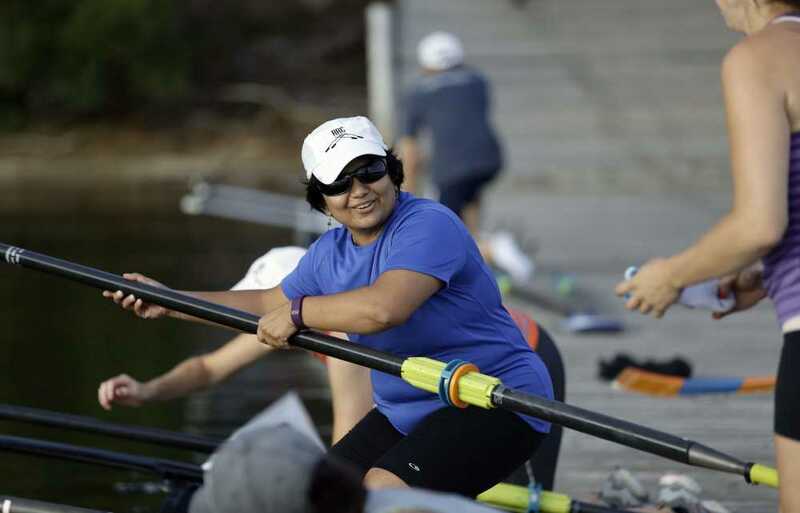 When Gopala immigrated to America, she finally got the chance to row crew. As a child in India, she had dreamed of the sport from watching Olympic telecasts. Now, twice a week, she pulls a pair of oars as her scull glides along tree-lined Lake Wheeler, far from her birthplace of Bangalore. RALEIGH, North Carolina -- When Manasi Gopala immigrated to America, she finally got the chance to row crew. As a child in India, she had dreamed of the sport from watching Olympic telecasts. Now, twice a week, she pulls a pair of oars as her scull glides along tree-lined Lake Wheeler, far from her birthplace of Bangalore. Gopala is among throngs of educated Indians who have moved in recent years to North Carolina's tech-laden Research Triangle and other areas across America. A 39-year-old software developer, she became a U.S. citizen three years ago. "America had given me the opportunity to pursue my own life," she said. Increasingly, the face of U.S. immigration resembles Gopala. For all of Donald Trump's talk of building a border wall and deporting 11 million unauthorized immigrants who are mainly Hispanic -- and for all of the enduring contention over illegal immigration -- immigrants to the U.S. now are more likely to come from Asia than from Mexico or Latin America. And compared with Americans overall, immigrants today are disproportionately well-educated and entrepreneurial. They are transforming the nation in ways largely ignored by the political jousting over how immigration is affecting America's culture, economy and security. As of three years ago, Census figures show, India and China eclipsed Mexico as the top sources of U.S. immigrants, authorized or not. In 2013, 147,000 Chinese immigrants and 129,000 Indians came to the U.S., compared with 125,000 Mexicans. Most of the Asian immigrants arrived in the United States legally -- through work, student or family visas. Immigrants also are more likely now to be U.S. citizens. Nearly half of immigrants over the age of 25 -- 18 million people -- are naturalized citizens, compared with 30 percent back in 2000, according to Census figures. Simultaneously, more Mexicans without documentation are returning home. The number of Mexicans in the United States illegally tumbled nearly 8 percent in the past six years to 5.85 million, the Pew Research Center found. Border Patrol apprehensions, one gauge of illegal crossings, last year reached their lowest point since 1971. With the share of U.S. residents born abroad at its highest level in a century, immigrants increasingly defy the stereotypes that tend to shape conversations on the issue. Consider: About 40 percent of Indian immigrants hold a graduate degree. Fewer than 12 percent of native-born Americans do. And earnings for a median Indian immigrant household exceed $100,000 -- more than twice the U.S. median. The result of this recent influx is America's 40 million-plus immigrants more and more reflect the extremes of America's economic spectrum, from super-rich tech titans to poor agriculture workers. The changes flash into view on a visit to the political swing state of North Carolina. The proportion of immigrants in the state's population has quadrupled from 1990 to nearly 8 percent. Similar trends have emerged in Georgia, Colorado, Oregon and Washington. None of these states approaches the 20 percent share in California and New York, where educated Chinese immigrants largely are concentrated. Yet the transformations are evident in a drive across the dense highways that connect North Carolina's Research Triangle. Indian immigrants have put their distinctive stamp on this area. Their rising numbers have established a broad community that has made it easier for new arrivals to integrate than it was for prior generations. Asked how they have been received in the community, about a dozen Asian immigrants said they generally have been warmly accepted despite the national furor over immigration. "Now, you come from India, you don't really have to know anything else," said Pranav Patel, a 57-year-old software developer. "The system is here to help you adjust. There are no real hardships." When the Hindu Society of North Carolina celebrated India's independence day in August, one prominent outsider showed up: Gov. Pat McCrory, a Republican in a heated re-election campaign that has been fueled in part by a crackdown on illegal immigration. "This is the best of America," he said, sharing the stage with a life-sized statue of Mahatma Gandhi. "This is the best of India. We work together. We learn together. We can pray together. We love family values together." Americans' sentiments about immigrants largely have hardened along racial, political and demographic lines. Overall feelings toward immigrant workers remain negative. But sentiment has improved since 2006, possibly a sign the growth of educated immigrants has begun to reshape attitudes, according to a Pew survey this month. Two-thirds of Republicans and 54 percent of whites said they think immigration harms U.S. workers. But a majority of Democrats, Hispanics and the college-educated said they felt immigrants made society better. By comparison, almost all economists view immigrants as helpful -- even essential -- for the nation's continued prosperity. Because of the aging U.S. population causing more retirements, most economists said immigrants are needed so the workforce can sustain overall growth. The anti-immigrant rhetoric has concerned Gopala. She feels fortunate no longer to be among the millions of foreigners still applying for U.S. residency. "I got very lucky that my green card was processed when immigration wasn't a bad word," Gopala said. "America had given me the opportunity to pursue my own life. On the day you're born in India, your life is written. But here, that is not true."